When I first moved to Seattle, I discovered that I enjoyed urban hiking more than regular hiking. Walking the city streets gave me an opportunity to learn neighborhoods and take photos. Besides Seattle, I have done urban hikes in excess of 10 miles in San Francisco, Vancouver, Portland, New York City, Auckland, Buenos Aires, Bangkok and Kuala Lumper. San Francisco and Seattle are my two favorite cities for urban hiking. To calculate the mileage of each urban hike, I use GMap-Pedometer once I get home. The majority of the hikes I do are less than 12 miles. They are not logged. I want to stress that I urban hike out of a sense of exploration. This is not a workout. I listen to my body and do not set distance or timed goals. I mix up the paths, distance and elevation variations as much as possible. I also prefer to hike alone. 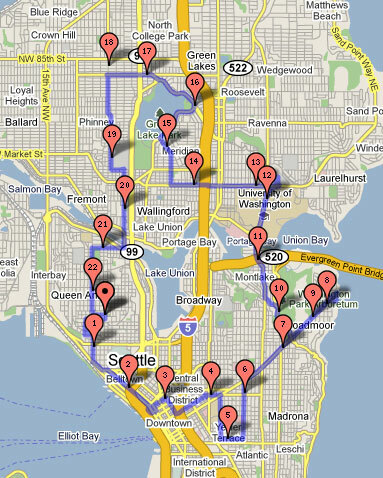 Urban Hike Seattle – My first Seattle urban hike was on Presidents Day 2008 and was 14.55 miles long. Urban Hike – Snow Edition – A 16.22 mile urban hike during the snow storm of 2008. Another Snow Storm, Another Urban Hike – Just 2 days after my snow edition hike, the snow started up again and I logged another 15.38 miles. Urban Hike Seattle – 22.5 Miles Edition – On Presidents Day 2009, I hiked 22.5 miles through Seattle. Urban Hike – Magnolia Edition – A hill intensive 12 mile hike connecting Queen Anne, Magnolia, Ballard and Fremont. Urban Hike – Flat Shoe Edition – I gave up my running shoes and started wearing shoes with a very flat sole. This was my first 12+ miler with flat shoes. Urban Hike – 22.6 Mile Edition – This one was just barely longer than my 22.5 miler. Urban Hike – Between the Bridges Edition – In 2010, I started mixing up the starting point for my Seattle hikes. This 14.05 hike connected downtown with the neighborhoods between the bridges along Lake Washington. Urban Hike – Beyond the Bridges Edition – A week later I did a 20 miler that extended upon the Between the Bridges hike. Urban Hike Seattle – Snowstorm 2012 Edition – A 20 mile hike during the snow storm of January 18, 2012. 19 Mile Urban Hike – Shoes Matter – How cheaply made shoes turned out to be better for hiking than the sturdy ones. Urban Hike San Francisco – 11 Miles, 3 Espressos – A new city requires urban exploration and espresso.